The Johann Wolfgang Goethe University Frankfurt am Main (also known as Frankfurt University; since June 1, 2008 presented as Goethe University Frankfurt am Main) was founded in 1914 as a Citizens' University, which means that while it was a State university of Prussia, it had been founded and financed by the wealthy and active liberal citizenry of Frankfurt am Main, a unique feature in German university history. It was named in 1932 after one of the most famous natives of Frankfurt, poet and writer Johann Wolfgang von Goethe. Today, the university has 31,228 students. university was founded in 1914 through private funding. Thus, the university owes its establishment to the link – which is characteristic for the city of Frankfurt – between dynamic research, the legacy of the Enlightenment, and the conscious commitment of the citizens of Frankfurt to the fundamentals of international trade and industry. 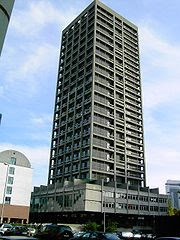 The University of Frankfurt has at times been considered liberal, or left-leaning, and has had a reputation for Jewish and Marxist scholarship (or even Jewish-Marxist). Thus, during Nazi times, "almost one third of its academics and many of its students were dismissed for racial and/or political reasons—more than at any other German university." (University homepage) It also played a major part of the German student riots of 1968. The University of Frankfurt is historically best known for the Institute for Social Research (founded 1924), institutional home of the Frankfurt School, one of the most important 20th century schools of philosophy and social thought at all. Some of the most famous University of Frankfurt scholars are associated with this school, including Theodor Adorno, Max Horkheimer, and Jürgen Habermas, as well as Herbert Marcuse, Erich Fromm, and Walter Benjamin. Others include the sociologist Karl Mannheim, the philosopher Hans-Georg Gadamer, the philosophers of religion Franz Rosenzweig, Martin Buber, and Paul Tillich, the psychologist Max Wertheimer, and the sociologist Norbert Elias. In recent years the University turned its attention especially to law, history and economics, creating new institutes like the Institute for Law and Finance (ILF) and the Center of Financial Studies (CFS). One of the university's ambitions is to become Germany's leading university for finance and economics, given the school's proximity to one of Europe's financial centers. Therefore Frankfurt University’s Goethe Business School developed a new M.B.A. program in cooperation with Duke University’s Fuqua School of Business, and has established an international award for research in financial economics, the Deutsche Bank Prize in Financial Economics.